Similar to captions on television, where spoken words appear as written text for viewers to read, Hamilton CapTel provides word-for-word captions of what’s said, to the individual who experiences hearing loss, during telephone conversations. 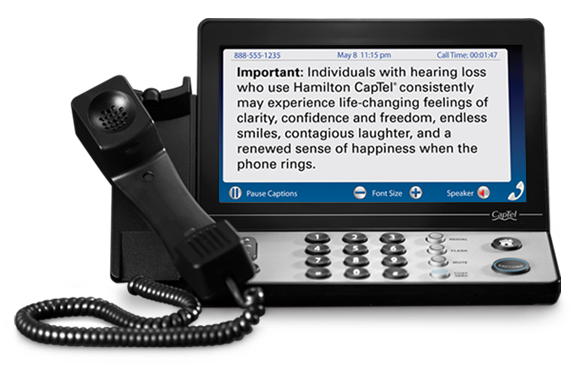 The Hamilton CapTel phone works like a traditional telephone – callers talk and listen to each other – with one very significant difference: captions are displayed on the built-in screen of the CapTel phone. So if an individual has difficulty hearing on the phone, they can easily read the captions for clarification. All that is required is a Hamilton CapTel Phone, telephone service and a high-speed Internet connection (WiFi or via Ethernet cable). The captioned telephone service is free and available 24/7, nationwide. 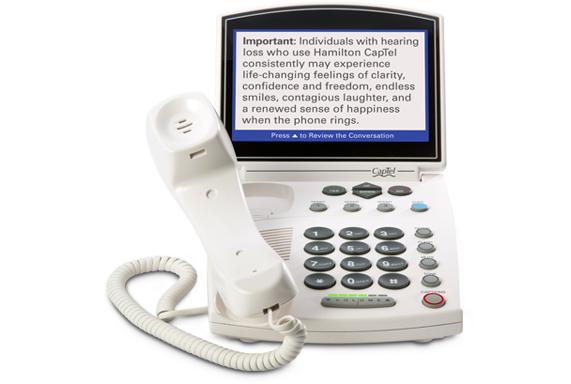 Placing and receiving calls with the Hamilton CapTel Phone works the same as any other call. All of the captioning takes place behind the scenes and does not interfere with or interrupt your phone conversation. All captions appear just moments after the words are spoken. Hamilton CapTel CAs process calls quickly and efficiently. You can experience clarity and have confidence that you’re receiving everything said on every call. If you or someone you care about just can’t hear on the phone, see the difference one phone call can make with Hamilton CapTel.